Trailhead and parking area are on a spur of Success Pond Road in Success, NH. To get there, take Unity Street off Rt. 16 in Berlin, 4.5 miles north of Rt. 2. In 0.9 miles, Unity Street becomes Coos Street. 0.1 miles after this, turn left onto Hutchins Street. In 0.8 miles, turn right onto Success Pond Road, a rough logging road. As you drive down Success Pond Road, make sure to stay straight on the largest road and not turn down any smaller spur roads. Watch for logging trucks, which always have the right-of-way. After 5.4 miles, turn right onto a spur road marked with a street sign for "Success Pond Trailhead". You can park here and walk to the trailhead if you are worried about the quality of the road ahead, but most vehicles which have made it this far will be able to continue. Drive 0.2 miles down this narrow dirt path and bear right at a fork in a clearing (another possible parking place). The road narrows even more and continues another 0.2 miles to a large clearing. Park here; the trailhead is in the far right corner. North of the heavily travelled areas in the White Mountains, Mt. Success is one of the many overlooked spectacular hiking destinations in the Great North Woods. It is located in the Mahoosuc Range, which crosses the New Hampshire-Maine border. Success is the northernmost peak in the New Hampshire section of the range, and the last peak traversed by the northbound Appalachian Trail before it enters Maine. Mt. 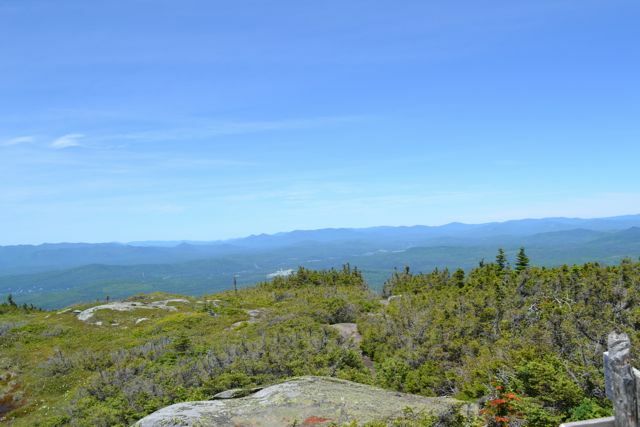 Success and its sub peak, The Outlook, offer incredible views of Maine, the northern Presidentials, and the many mountain ranges of northern New Hampshire. Consistent with the nature of the Mahoosuc Range, the hike to Mt. Success is rugged and difficult. The Success Trail starts at the end of a logging road. The trail begins following a small stream gently up through the forest. After some easy walking, the trail heads more steeply uphill through an open forest. It continues straight uphill at a moderate grade and soon starts to angle across the increasingly steeper mountainside. As it gets further up, it suddenly turns directly uphill. An extremely steep climb up eroded (and possibly slippery) rock slabs begins. Eventually, the trail eases and reaches a ridge top. At 1.6 miles from the parking area, turn right onto Outlook Loop. It is an easy 0.3-mile path over open rock with many blueberry bushes along the way. The path leads past a limited view before leading out to the summit of The Outlook. The reward for the difficult climb is a spectacular 180-degree vista to the southwest. The summit of Mt. Success looms over you to the southeast. Directly ahead, across a deep valley, is an impressive cliff on the side of North Bald Cap. Behind this cliff are the northern Presidentials and the Carter Range. Off to the northwest are many distant mountains in the ranges from the Kilkenny to Dixville Notch. Continue on the path as it leads off The Outlook past the top of very steep cliffs and back to the main trail. Turn right to continue on Success Trail. From here, you get a rest from the climbing as the trail leads across a flat ridge. Along this ridge are many wet areas and swamps on the trail which are crossed on a series of bog bridges. In the middle of the ridge is a set of historical artifacts: the remains of a horse logging camp. The artifacts include a sled runner, stove parts, and buckets. In 0.8 miles from The Outlook, the trail reaches the Appalachian Trail atop the summit ridge. Turn right onto Mahoosuc Trail for a rugged 0.6-mile climb with several tricky rock scrambles. When you finally arrive at the summit, you will be rewarded with the full 360-degree view. The view from the southwest to the northwest is the same as from The Outlook, but from much higher. To the south, the view is somewhat blocked by trees due to the fact that the summit is very long and flat. To the north and east is the Maine section of the Mahoosuc Range, including Bear Mountain to the east, Mt. Carlo and Goose Eye Mountain nearby to the northeast, and Old Speck Mountain and Mahoosuc Arm beyond. Below you on the summit is a long alpine bog with the Appalachian Trail leading south across it.